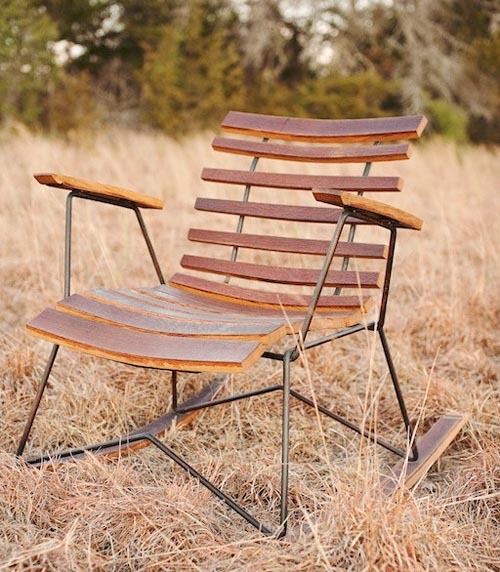 Rocking chairs are easy to love, but perhaps some have a higher love factor than others. Like this one...whose wood derives from a used wine barrel in Central Texas. The curvature of the barrel is carried through in this design, brilliantly crafted by Tyson Pendergrass and Gable Bostic of Petrified Design in the Austin/Hill Country region of Texas. If you follow Sweet Peach, you may have noticed that I have a weakness for anything wood and metal. These expertly constructed tables certainly make me a little weak in the knees. Tyson sheds light on he and Gable's aesthetic, "We design furniture with a story and a purpose and love that what we design we haven't seen before. Our furniture can work in the modern city loft or the rustic mountain cabin." This East Polk Low Lounger stays true to its name as one who reclines here should plan to stay awhile. Think of a sunset, a beer, maybe a second low lounger close by for a friend...life is made better with guys like Tyson and Gable around.